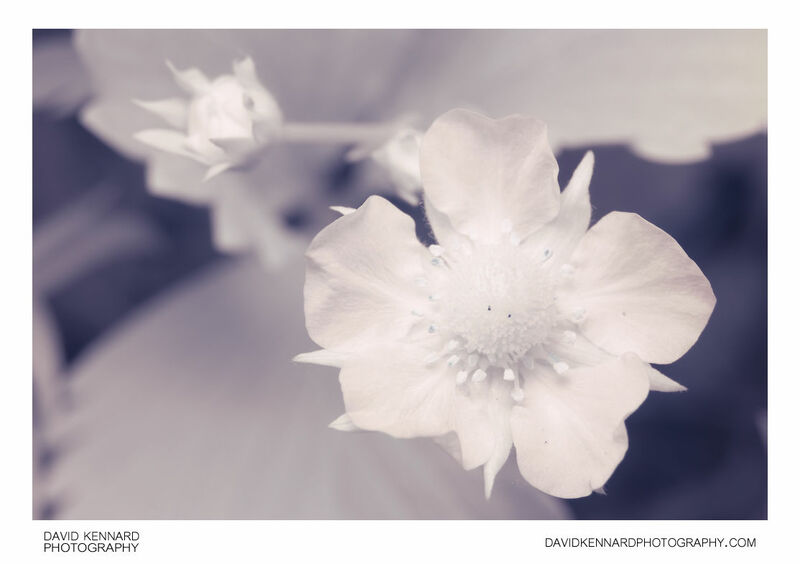 Close-up infrared photograph of a Garden Strawberry flower. The leaves of the plant reflect a lot of infrared light, making them almost as bright as the flower. Fragaria × ananassa, commonly known as strawberry or garden strawberry, is a hybrid species that is cultivated worldwide for its fruit. The fruit (which is not a botanical berry, but an aggregate accessory fruit) is widely appreciated for its characteristic aroma, bright red color, juicy texture, and sweetness. It is consumed in large quantities, either fresh or in prepared foods such as preserves, fruit juice, pies, ice creams, milkshakes, and chocolates. Artificial strawberry aroma is also widely used in many industrialized food products. The garden strawberry was first bred in Brittany, France, in the 1750s via a cross of Fragaria virginiana from eastern North America and Fragaria chiloensis, which was brought from Chile by Amédée-François Frézier in 1714. Cultivars of Fragaria × ananassa have replaced, in commercial production, the woodland strawberry (Fragaria vesca), which was the first strawberry species cultivated in the early 17th century.